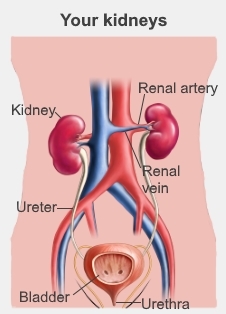 Kidney cancer (also called renal cancer) happens when the cells in the kidney become abnormal and grow into a tumour. It's most common in people over 60. Kidney cancer mostly has no symptoms. It's often found when you have an X-ray for other reasons and the X-ray shows something out of the ordinary. Symptoms can include feeling unwell, being tired, losing your appetite, having a fever, and sweating heavily – especially at night. You should always see your doctor if you have blood in your urine (called haematuria) or feel a lump or swelling in the area of your kidneys. We don't know what causes most kidney cancer. However, there are a few things that may increase your risk, such as getting older, smoking, and being overweight. Men are more likely to get kidney cancer than women. Some rare genetic disorders also increase people's risk of kidney cancer. Your kidneys have different types of cells, and the type of cancer depends on the type of cell the cancer starts in. The two most common types of kidney cancer are renal cell cancer and transitional cell cancer. There's no screening programme for kidney cancer. If your GP suspects you may have kidney cancer, they'll examine you for any lumps or swellings and ask you questions about your general health. They may take blood and urine tests. Sometimes urine tests or scans done for something else pick up kidney cancer. Your GP might need to refer you to hospital for an ultrasound, or they may refer you to see a urology specialist. The specialist may arrange a cystoscopy, which is a test where a special type of thin telescope is inserted through your urethra (the tube you pass urine through) and into your bladder. You may need a CT scan of your urinary system. This is called a CT urogram. Treatments for kidney cancer ranges from monitoring small cancers that are unlikely to cause any problems, to surgery, chemotherapy, and radiotherapy. You can read detailed information about the different type of treatment, when they're used, and any side effects on the Cancer Research UK website. This section includes detailed information about the different types of kidney cancer, how they're diagnosed, and how they're treated. Written by HealthInfo clinical advisers. Endorsed by clinical director, Urology, Canterbury DHB. Page created November 2017.